I am the University of Louisville's costume shop manager and professor in acting and pedagogy. I work as the costume designer for the traveling reparatory company and currently work as a director and writer. I found the costume shop while in grad school. I was assigned to put in hours for my assistantship there.My maternal grandmother taught me to sew as a child and I loved it, so I applied for the job when it came open. I had been a traveling actor for several years and wanted to come home to put my roots down in Louisville again. I love my students the most. I love their energy and their eagerness to learn and create with their hands. This is a daily inspiration to me.I love that the job is never the same. 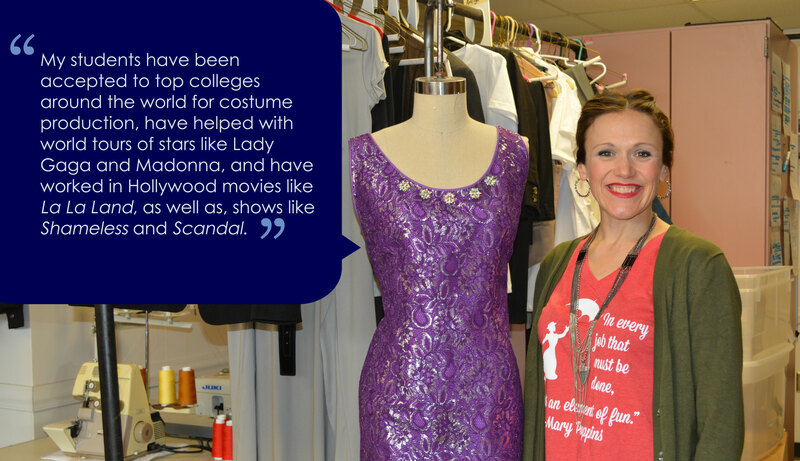 Each show brings a different challenge that is a "first" for the costume shop. How did Mercy prepare you for this career? At Mercy, I was taught to stand up for myself as a female and make my voice heard.I look people in the eye when I talk to them, and I listen. This was taught at Mercy. I use kindness and creativity to solve problems. I learned to do this with patience at Mercy.I am most thankful for my Mercy education!Thank your parents, ladies; it's worth the money! What advice would you give Mercy girls interested in pursuing a career in theatre arts? Take classes or volunteer in community theatres to find out which part of the theatre you fit into. It's a hard business and very competitive, but you will find that people in theatre, like people everywhere, want to work with those who are kind, reliable, punctual and talented. What are some of your favorite memories in theatre? Some of my favorite memories are from working in the shop when we do large shows.My students get to build costumes from drawn designs. These are invaluable experiences that give them a leg-up in the industry. Each show brings a new experience and a new project. What is your favorite Mercy memory? I loved working on theatrical productions at Mercy. Under the leadership of Gary Tipton, we learned how much work goes into putting a show on its feet and were asked to participate in all parts of it. When I was a freshman, my best friend, Kathleen Conrad (Colby),and I put our theatrical skills to use to win the arts fair.We put together a presentation on Korea that included costumes and an authentic fan dance. This was a big deal because we won "best overall" at a fair where the entire school participated. Beating out seniorswho performed Shakespeare scenes was a huge "feather in our cap" and solidified us an unstoppable team throughout our time at Mercy. We still are an unstoppable team.